Previously, on MinerBumping... Agent ST0NER SMURF of Vrix Nation corp shared some of the tearmails they've been receiving lately. We learned that a large fraction of the carebears who lose their pods are desperately concerned with making sure nobody knows how much they care about their losses. Time for another category--another bucket of tears. That's right, the Code. It's your only hope. Excuses will not save you if you fail to comply. Strangely, many carebears do send our Agents EVEmails full of excuses. They try to explain away their bot-aspirancy, presumably to lay the groundwork for a reimbursement request. Some of the excuses betray a lack of understanding of EVE's game mechanics. How do you get blown up while docking, if you warped to the station using an insta-dock bookmark? I mean, you did use an insta-dock, right? While some blame lag or dodgy EVE mechanics, others invoke client-side technical failures. Curiously, carebears only seem to experience problems with their computer while our Agents are shooting at them. Nevertheless, it is the responsibility of each EVE player to ensure that his computer is in proper working order before entering highsec. Here's another common excuse: "I wasn't AFK, I was just looking at the market, my cargo, my EVEmails, my wallet, my corp chat, my private convo..." In this case, the greedy carebear condemns himself with his admission. He was admiring his cargo like some miserly old Scrooge counting his money. When a carebear steps away from his keyboard for "ten seconds", you can be sure that it's the exact same ten-second window during which he'll be ganked by one of our Agents. Of course, if you only need to leave the game for ten seconds, you should have no problem docking up for such a small amount of time, right? EVE Online. The wash. Pick one. Gotta love the carebears and their increasingly outlandish excuses. Don't they realize that they only serve as admissions of guilt? My favorite is when a miner eagerly throws his loving family under the bus in the hope of qualifying for reimbursement for his lost space pixels. Nothing less than full compliance is acceptable. Capsuleers must be personally responsible for all of their actions and inactions. Such is the Code, such is life. Such as it is with authoritarian fascists like Jamey and his brownshirts, aka his CHODE. slaves. CHODEanon is way out of touch with the meta. 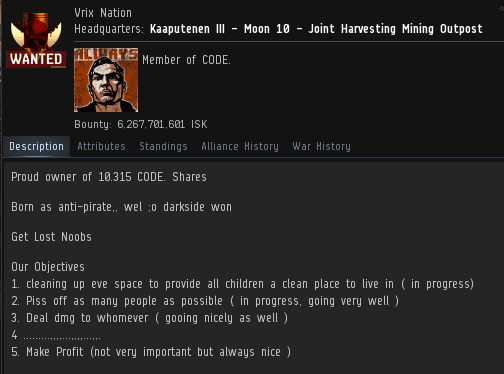 Democracy doesn't work in EVE because nobody wants play bureaucracy online. See how few pubbies even bother to vote for a CSM rep.
Charismatic dictatorship with firm laws and swift justice is the most effective way to build and sustain an empire. Praise James 315 and long live the Code! Yep, the CHODE. slaves are just angry that "bot aspirants" are taking ore that their many alts could have mined while AFK/dual boxing. I mean how angry does a miner have to be to post anonymously here daily? Listen, you cannot blame us for what you're friend did to his kid and himself. You cannot blame yourself either. It just a game. I read Minerbumping every day because it always brings me good news. The same can't be said for mainstream news outlets.